Progressive Charlestown: Save these peeps! Rhode Island’s population of piping plovers — the rare, sand-colored shorebird that breeds primarily on ocean-facing beaches — has grown significantly since it hit an all-time low of fewer than 20 pairs in the early 1980s. But 2017 was a bad year for the birds. Heavy spring rains and a continuing battle with predators caused a decline in the number of chicks the plovers produced. According to Jennifer White, the biologist with the U.S. Fish & Wildlife Service who monitors the plover population, the statewide breeding population is about 100 pairs, though the population fluctuates annually as some birds move back and forth to beaches in Massachusetts and Connecticut, depending on changing beach conditions. On South County beaches, where most of the birds breed, White counted 73 pairs of piping plovers this summer, mostly at Trustom Pond National Wildlife Refuge in South Kingstown, Quonochontaug Beach in Charlestown, and East Beach in Westerly. Another 23 pairs nested in Little Compton at Goosewing Beach Preserve, Briggs Beach and Fogland Marsh Preserve. In addition, one pair nested at Third Beach in Middletown. White said each nest, on average, produced just 0.68 chicks, well below the 1.25 needed to maintain a stable population, and far below the 1.62 chicks produced last year. The one bright spot was at Ninigret Conservation Area, where seven pairs of plovers produced an average of 2.29 chicks per nest. The chilly, wet spring also caused many nests to fail. Staff and volunteers from The Nature Conservancy monitor the piping plovers on Little Compton beaches. Tim Mooney, the conservancy’s director of communication, said those beaches faced similar declines in chick productivity. 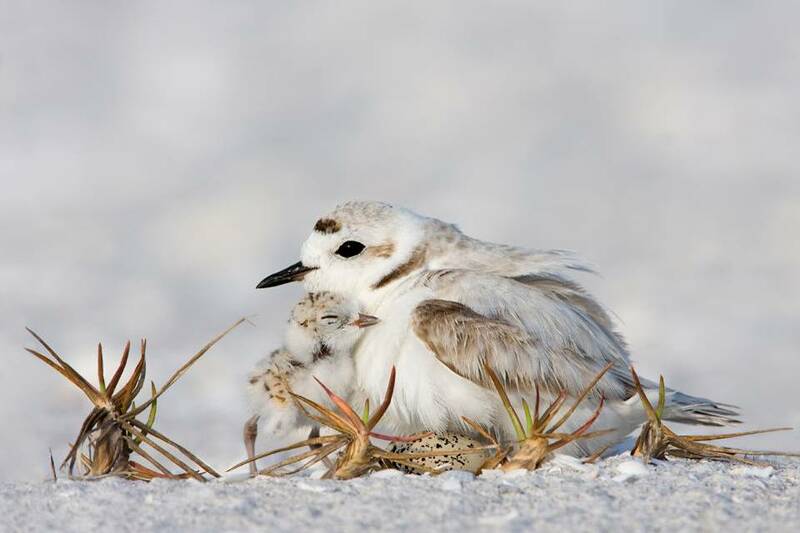 Mooney and White also noted that abundant human beach-goers can also be a factor in the success or failure of piping plover nests, though the beaches that attract the most human visitors seldom have any plovers attempting to nest. The Nature Conservancy and the Fish & Wildlife Service conduct daily patrols of the beaches where the plovers nest, rope off nesting areas, and place mesh “exclosures” around nests to keep predators at bay while allowing the birds free access to and from their nests. They also keep daily records of how many plovers are nesting at each beach, how many eggs are laid, and how many chicks survive to fledge. Mooney said an important part of conservancy’s monitoring efforts is pointing out the plovers to beach visitors so they can develop an appreciation for the birds. “Once you’ve ... seen a chick run across the beach, you can’t help but want to do something to help them,” he said. Piping plovers are categorized as threatened on the federal Endangered Species List. They breed on Atlantic coastal beaches from Newfoundland to North Carolina. (A separate population breeds in the Great Lakes region.) To be removed from the list, they must achieve a chick productivity rate of 1.5 per pair for five consecutive years and maintain a breeding population of 2,000 pairs.